As the Global Practice Leader of A&M’s Transaction Advisory Group, Mr. Aversano works to deliver the firm’s services to clients not only in North America but throughout Europe, the Middle East, India, Asia and Latin America as well. 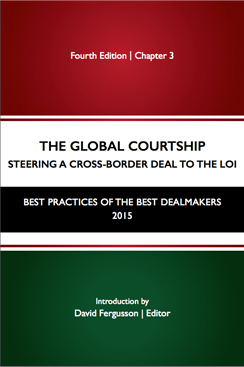 He leads the group’s efforts in the cross-border delivery of services to both private equity firms and strategic buyers around the world. Mr. Aversano has assisted numerous private equity firms and strategic buyers across a wide spectrum of industries. He specializes in providing accounting and transaction structuring advice for leverage recapitalizations, purchase accounting and SEC reporting, assessing quality of earnings, and GAAP accounting. He critiques financial models and reviews target companies’ financial performance to identify cost reductions and / or operating efficiencies. He also brings extensive experience to legal counsel, including expert technical accounting guidance for purchase price arbitration and related analysis and support of purchase price adjustments. He has worked with management teams of private equity-backed portfolio companies to complete add-on acquisitions and direct platform investments. 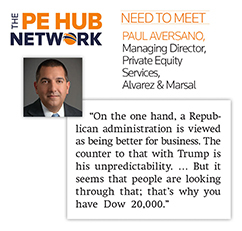 Prior to joining A&M, Mr. Aversano was a Partner and Director of Middle Market Private Equity with Ernst & Young in New York. In this role, he led financial accounting due diligence projects for private equity investor groups, and the development and coordination of the firm’s go-to-market and service delivery strategies focused on private equity funds with committed capital of approximately $500 million to $3 billion. Previously, Mr. Aversano was with Arthur Andersen’s Transaction Advisory Services practice in New York. Earlier, he was with the commercial products and services division in the Audit & Business Advisory practice of Arthur Andersen in New York. 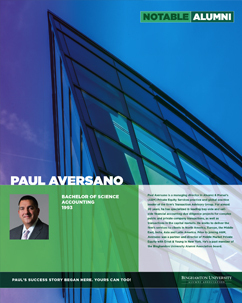 Mr. Aversano earned a bachelor’s degree in accounting from Binghamton University, School of Management. He is a Certified Public Accountant (CPA) in New York, and is an active member of the American Institute of Certified Public Accountants, the New York State Society of Certified Public Accountants and the New York Chapter of the Association for Corporate Growth. Mr. Aversano is also a member of the Association of Certified Fraud Examiners(CFE), and has been a guest lecturer of graduate-level classes at Binghamton University and a speaker on financial accounting due diligence at industry seminars. He currently serves on the Board of Directors of Youth I.N.C (Improving Non-Profits for Children) and is a former member of both the Audit Committee of the Manhasset School Board of Education and the Alumni Association Board of Directors of Binghamton University. 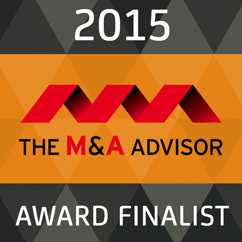 In 2015 Mr. Aversano was named the “Service Professional of the Year” by The M&A Advisor and was formerly a finalist of The M&A Advisor’s 40 Under 40 Award in recognition of outstanding achievements in the M&A and financial industry. Mr. Aversano is also a regular contributor to Fox Business Network.